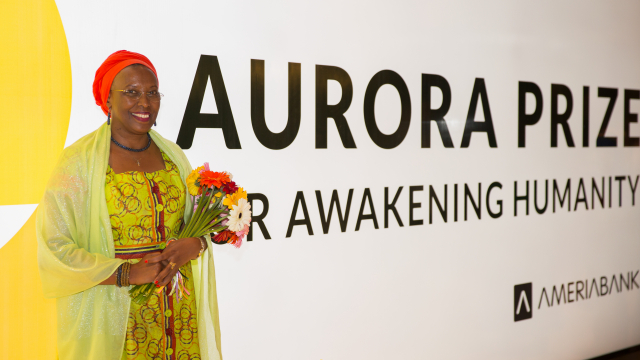 Marguerite Barankitse, the inaugural Aurora Prize Laureate, is paying a special visit to Armenia in advance of the weekend of events marking the presentation of the 2017 Aurora Prize for Awakening Humanty. She is meeting with communities, cultural and religious leaders in Armenia and Artsakh and will present her mission and the impact of the 2016 Aurora Prize. Ahead of 2017 Aurora Prize Events the first Aurora Prize Laureate Marguerite Barankitse pays a special visit to Armenia. She will meet with communities, cultural and religious leaders in Armenia and Artsakh and will present her mission and the impact of the 2016 Aurora Prize. On May 20 Marguerite Barankitse visited Armenian Genocide Museum-Institute where a special exhibition is opened dedicated to Aurora Mardiganian, the inspirational woman behind the Aurora Prize. Mrs. Barankitse left a note in the Memory Book of Honorable Guests and laid flowers at the Armenian Genocide Memorial. At the end of the visit the First Aurora Prize Laureate planted a tree in the Memory Alley of Tsitsernakaberd complex in memoriam of the Armenian Genocide victims. “The mission and idea behind the Aurora Prize is very important to us and we felt the need to invite the Aurora Prize Laureates to have their symbolic presence at Tsitsernakaberd Complex planting a tree every year. It will become a continuous tradition both for Armenia and Armenian Genocide Memorial Complex,” said Hayk Demoyan, director of the Armenian Genocide Museum-Institute. From Yerevan Maggy will travel to the south of Armenia where she will visit the medieval Tatev monastery complex. In Goris she will meet local NGO representatives, cultural leaders and students. She will also visit Axel Bakunts house-museum. Later Marguerite Barankitse will take a trip to Artsakh where in Shushi she will visit St. Ghazanchetsots church, Upper mosque, and Naregatsi Art Center where a cultural performance will be set and she will meet with local community. In Stepanakert Marguerite Barankitse will meet the students of Artsakh State University, will visit War Martyrs Museum. Later she will go to Gandzasar monastery. Marguerite will also pay a visit to Gyumri where she will go to the Armeian Catholic Church and “Trchunyan” orphanage. In Mother See of Holy Etchmiadzin Marguerite Barankitse will meet His Holiness Karekin II, Supreme Patriarch and Catholicos of All Armenians and will present her work and the impact of the 2016 Aurora Prize. Maggy will also meet with the representatives of «Altitude 5165» humanitarian organization in Etchmiadzin. From May 26 with hundreds of other guests Marguerite will attend Aurora Prize Events in Yerevan and Dilijan. The events will culminate with the 2017 Aurora Prize Award Ceremony on May 28 in Yerevan. Marguerite Barankitse, the founder of Maison Shalom and REMA hospital, received the Aurora Prize on April 24, 2016, for the exceptional impact of her actions on preserving lives during the years of civil war in Burundi. To date, she has saved 30 thousand children and offered them shelter and care.